Vlietland, known as the Riveria of the Randstad, has acres of parkland, watersports and bird watching opportunities. 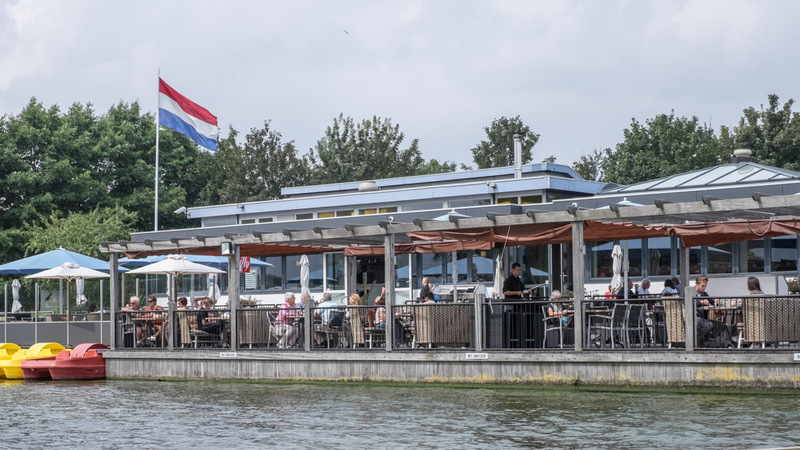 Hidden amongst the trees, with panoramic views across the lake, you will find At the Waterfront (Rietpolderweg 13, 2266 BM Leidschendam), a riverside restaurant, offering delicious lunches and dinners. Alfresco dining is a must on a warm, sunny day, and when the weather takes a turn for the worst, dining inside is also lovely. With a contemporary, modern, light and airy feeling, this is a perfect spot for lunch or dinner. The menu will surprise you whilst tempting your tastebuds to try something new, all at a very reasonable price. An oasis of rest, relaxation and culinary delights await you. Open May to September from 9am until late. You can reach Vlietland by taking the A4 from The Hague, (direction Amsterdam), take exit 7 (direction Vlietland/Zoeterwoude), follow the very well signposted route. Once in the recreational area, take the first right and continue on this road. You will find At the Waterfront on your left (about 1 km). Free parking is provided, although during the busier summer months you may have to park on the road outside. If you are feeling more energetic, take to the bike and enjoy a beautiful scenic ride from the city centre. Head in the direction of old Leidschendam and take the Westvliet (direction Leiden), which brings you to At the Waterfront within a 45 minute ride. 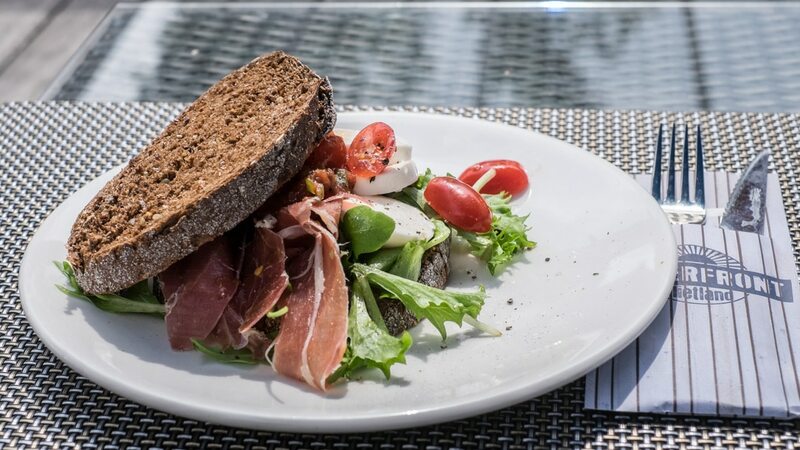 Open sandwiches, salads, soups and main courses are the lunch time offerings. Take a healthy appetite along with you, as the portions are very generous. The open sandwiches are something to be seen to be believed, and all of it mouthwateringly tasty. If you can’t decide what to choose, the chef offers a lunch tasting menu, giving you the opportunity to try more than one thing. If you just want a quick bite, then a standard snack menu offers something lighter, or to share. The dinner menu is a little more adventurous – scallops with parma ham, fried veal liver with Madeira sauce and caramelised onions, duck roasted in it’s own juices with a spring roll, as well as various fish/seafood options. There are also vegetarian plates such as risotto or vegetable tompouce, which is a Dutch speciality of layers of mille-feuille pastry. Normally served with layers of sweet cream, this version, obviously savoury, has me intrigued. The classic choices of sate, spareribs, steak or a burgers are also available if you are not an adventurous diner. Perhaps you have something special to celebrate? A special fine dining option of a four-course dinner, created with seasonal, fresh, local ingredients, is available. If you have room afterwards there are some interesting dessert options and a menu for children. In addition to this oasis of culinary excellence, there are activities, sure to appeal to all members of the family. You can hire kayaks by the hour, or take a pedallo for a more relaxed trip around the lake. Those wanting something more challenging can take sailing lessons, learn to climb or just simply relax on the beach. With the water gently lapping against the shore, as a cool, refreshing breeze comes soothingly across the water, you would be forgiven to forget that you are still in the Netherlands. Whatever your reason for visiting Vlietland, you will find a wealth of things to do. Be sure you don’t miss a visit to At the Waterfront. Originally from the UK and having travelled extensively professionally and personally, Charlie lives in Voorburg, Zuid Holland and speaks Dutch fluently. A keen Photographer and Writer she plans to visit, photograph, and write about European Cities; and believes that life is full of surprises. . . . .